As it approaches victory in Syria with the help of Russian air power, Iran and its terrorist axis members are turning their attention to Israel, and trying to ignite fresh Palestinian violence. Israel's Channel 10 News reported on Monday evening that Qassem Soleimani, the commander of Iran's elite Quds Force foreign operations unit, called the leaders Hamas and Palestinian Islamic Jihad in Gaza, urging them to escalate attacks on Israel. "There is huge Iranian pressure on the Palestinian factions to begin a maneuver," the Channel 10 report said. "And [Hizballah chief Hassan] Nasrallah is calling for a third intifada." It is a clear sign that, as the ISIS caliphate is erased from the map, another radical Islamist force is gaining strength, this one many times more powerful. Radical Shi'ite forces backed by Iran are moving into the vacuum left behind by ISIS. With confidence growing due to battlefield victories in Syria and Iraq, Iran and its radical proxies are seeking to take over the Palestinian arena as well, increasing terrorism against Israel. In a speech delivered from Hizballah's south Beirut stronghold of Dahiya on Monday, Hassan Nasrallah said his organization – which has evolved into a hybrid guerilla-terrorist army - and its allies would renew their focus on the Palestinians, following "victories elsewhere in the region," Reuters reported. Thousands of followers chanted "death to Israel," as Nasrallah promised assistance to armed Palestinian factions and called on them to keep up their conflict with Israel. These developments are the latest signs of a regional shift, which has left the Iranian axis as the dominant radical Islamist force in the region. 4. The pragmatic Sunni coalition. Today, only the pragmatic Sunnis and the Iranian-Shi'ite axis remain as major regional forces. ISIS is reverting back to a decentralized terror network, while the Muslim Brotherhood in Egypt is decimated. Saudi Arabia leads the moderate Sunni coalition of states, which are allies of the United States. This bloc views Israel as an ally too, out of a recognition that Iran is its real enemy, not the Jewish State. Today, the Shi'ite axis is on the move. Iran is the mother ship, and its most prominent agent is Hizballah, which has more firepower at its disposal than most NATO members. The axis has tens of thousands of Shi'ite militia members active across Iraq and Syria. And it is preparing to expand. In recent days, a powerful Iranian-backed Iraqi militia member visited southern Lebanon, where Hizballah provided him with a tour of the Israeli border. The visit signals Iran's intention to direct its regional assets against Israel. The core of the Shi'ite axis is the Islamic Republic of Iran itself, whose regime is guided by Shi'ite Islamist doctrine. "The Islamic regime in Iran wants to fully implement the Islamic Shari'a. It will be the instrument that triumphs over the enemies of Islam," Iran's Supreme Leader Ayatollah Khamanei said last month. 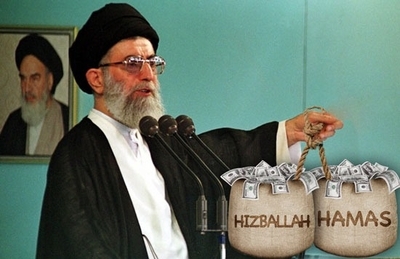 Iran's military industries are flush with cash, and they are mass producing powerful weapons. These arms don't just stay in Iran – many are exported to Iran's dangerous clients across the Middle East. . These are the forces moving into the vacuum left by Islamic State's demise. "I welcome the recent and great victories of the Islamic Revolution front against the front of lies and the destruction of the accursed regime of ISIS," IRGC commander Mohammed Al Jafari said recently. Iran wants to establish a continuous land corridor linking it to Iraq, Syria, and Lebanon. Such a corridor would enable Iran to move fighters and weapons from its border all the way to the Mediterranean coast. It would run parallel to the air corridor used by Iran to traffic weapons and fighters from Iran to Syria and Lebanon. The Shi'ite axis monopolizes political and military power in Lebanon, via Hizballah, and uses its proxy forces to heavily influence Syria and Iraq. In addition, it wields heavy influence in Yemen, where the IRGC supports the Ansar Allah radical Houthi group, which recently said it fired a cruise missile at a nuclear reactor in Abu Dhabi in the United Arab Emirates. The repeated use of surface-to-surface firepower by the Houthis against civilian targets in Saudi Arabia mimics tactics used by Hamas and Hizballah against Israel. Terrorism under an Iranian nuclear umbrella? The idea that the threat posed by the Iranian axis can be limited to the Middle East was recently disproven by Iran itself. After European criticism of Iran's ballistic missile program, officials threatened to increase Tehran's ballistic missile ranges in order to reach Europe. Israel, for its part, has vowed to stop the Iranian axis from taking over next-door Syria. A recent surge, according to media reports, of Israeli strikes on Iranian axis targets in Syria would seem to be evidence of Israel's determination to challenge Iranian plans. Earlier this month, the strikes reportedly targeted an Iranian military base under construction south of Damascus, and the CERS weapons development and production site on the outskirts of the Syrian capital. Yet the Islamic Republic's nuclear program, dormant for now, remains the elephant in the room. A powerful Shi'ite axis operating under an Iranian nuclear umbrella would pose a new level of threat to global security. Iranian-run terrorist networks and armed forces could operate with impunity if the Iranians reactivate their nuclear sites in the future, which they intend to do. The threat to international security posed by Iran far outweighs the one ever posed by ISIS.